As I’m eating less meat these days, I’m always on the look-out for recipes that use beans and legumes. They’re healthy, filling, and full of protein and fiber. But when I think falafel, I think fried and weekend project, too. But Tasty Kitchen member janecooks offers a baked version of the fried favorite that’s weeknight-easy. 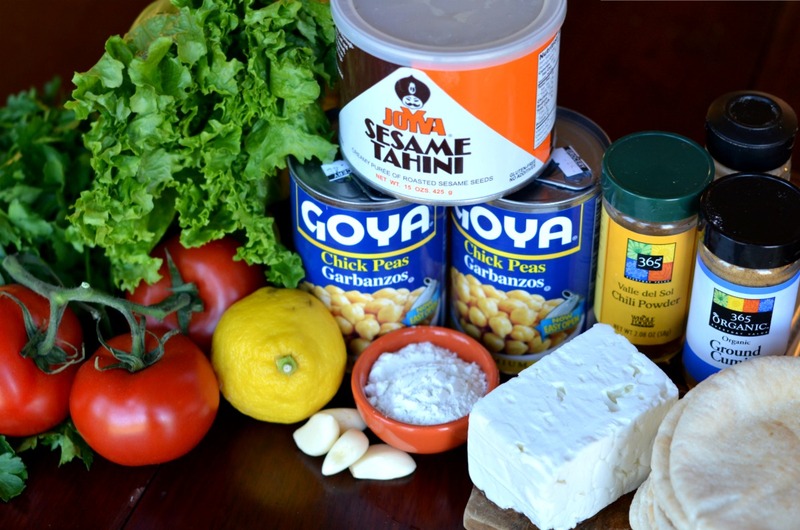 And with two cans of chickpeas as the bulk of the meal, it’s easy on the wallet, too. These Baked Falafel Pitas are colorful, flavorful, and oh-so delicious. They received rave reviews in my house and I’m sure they will in yours. Bright, colorful, flavorful ingredients. That’s always a good start. 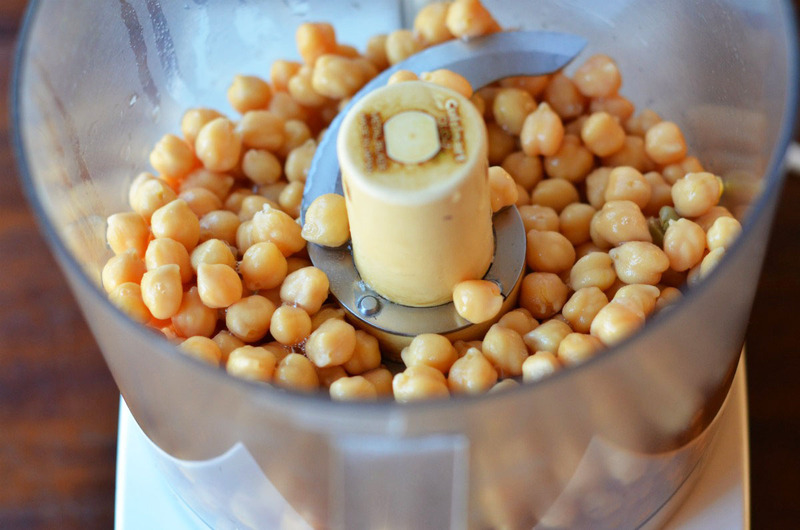 Drain the chickpeas and pour them into your food processor. Add the flour, parsley, garlic, cumin, coriander, chili powder, salt and pepper. Blitz the ingredients until it looks like this. 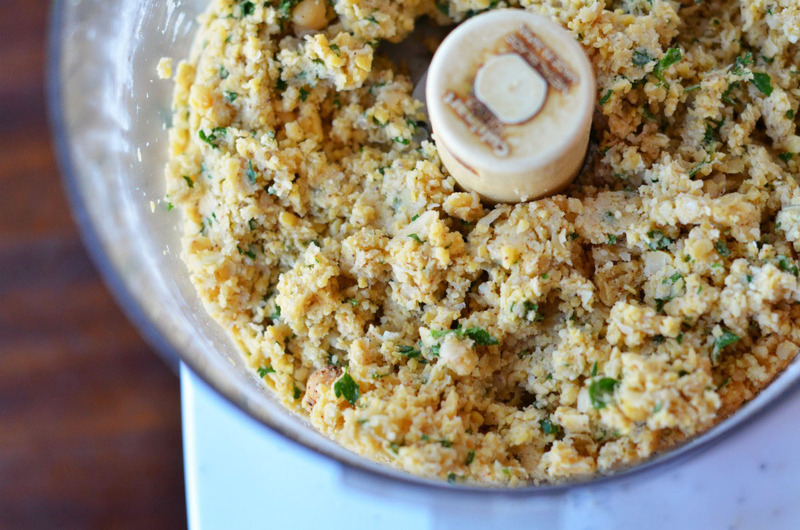 If you don’t have a food processor, you can use a fork or a potato masher instead. Form chickpea patties about 1 ½ inches wide by 2 inches thick. Place formed patties on a lightly greased baking sheet and bake for 15-20 minutes. 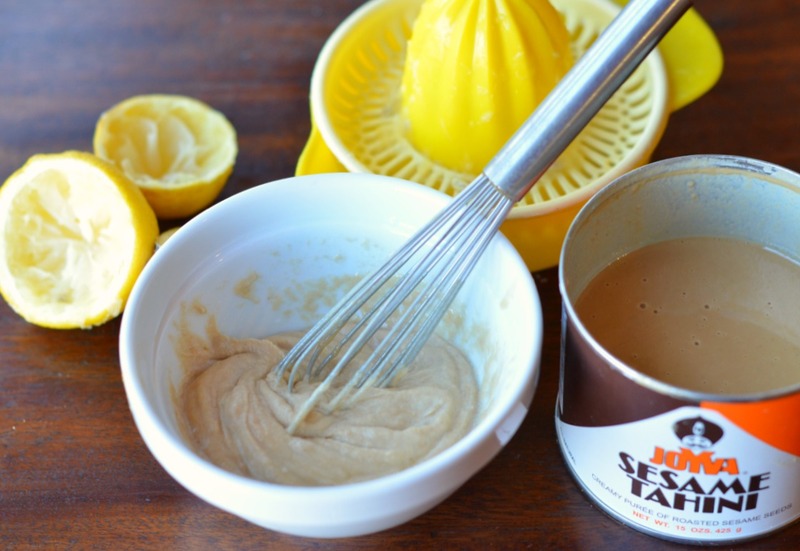 While the chickpea patties are baking, make this tahini-lemon sauce. We added a little water to make it more … saucy. Assemble by spreading a portion of the tahini-lemon sauce inside of each pita. Then add a couple of chickpea patties and a generous amount of lettuce, tomato, and crumbled feta. Enjoy! Thanks to Jane for sharing these Baked Falafel Pitas, I’m definitely adding these to my weeknight repertoire! The recipe is awesome. I made it and it tasted amazing. Can you provide the recipe for the Hummus with this article to make it a complete falafel sandwich experience. please check out my page and see how my falafels have turned out. thanks! I never had Tahimi and since im currently living in Japan i do not have the slightest idea where to get it. Is there aything that is similar in taste that i can substitue the Tahimi with? Well I’m sorry to say that I actually made them last weekend and was definitely NOT thrilled with the result. I ended up baking them like 3 times longer than the recipe stated but still they didn’t really form that great, they sort of fell apart when you picked them up. They looked like cookies on the outside, but were still too mushy inside. I didn’t make them too large or anything, in fact I made them pretty flat so that they would for sure cook through easily. Bottom line…sometimes there’s a reason we fry stuff instead of baking it. They look great and the recipe seems straight forward. I will definitely try! Thanks! Looks great! I don’t have a food processor though, can this mixed in the blender??? I want these in my belly. Just bought some Tahini so I’m thinking I need to whip this up! These look fantastic! Trying them out this week! Made these last night and everyone loved them….even my 14 year old carniverous son! My hubby thought the tahini sauce was a bit overpowering compared to the rest of the flavors, but otherwise enjoyed them. I also made a tzatziki sauce which added another layer of yumminess. I served this with a couscous salad and for dessert made Ree’s apple tart from her “10 favorite summer desserts” post. Thank you for a wonderful recipe! Made these lastnight and it was fantastic! Even my fiance, who previously hated falafels thought they were amazing. 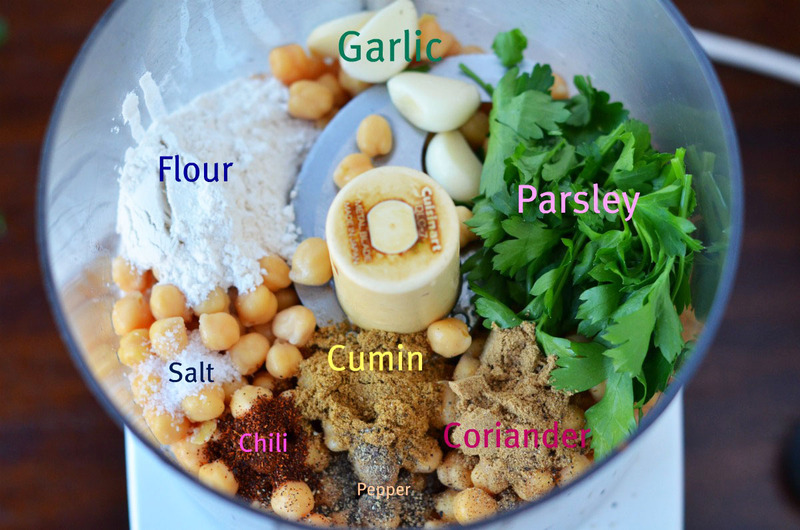 I love falafel – I am going to give this version a try. Looks really yummy. I have never had a falafel before and it’s funny because all I hear about is people loving falafels. This looks really good, and it doesn’t look too difficult to make. My recipe is very similar to this but I fry mine. And add some diced onion. I just don’t find frying that messy and intimidating for just a weekend project and in my opinion they need that little bit of oil to get the proper flavor. My husband, who was a very picky eater, can’t get enough falafel. We add some ranch dressing to them because I NEVER think to have things on hand for tzatziki and he isn’t crazy about too much tahini. I do think they are better with home cooked beans. Hummus is definitely better using home cooked and slightly warm beans. I have to try those! The look and sound delicious! AND easy- what a great combo! These sound great! Do they keep well? Wondering if I can make them ahead of time and reheat at meal time? I LOVE the pictures – and I love falafel – so thank you!! If only I had bought pitas yesterday I could make this for dinner tonight. I will be picking some up next week so I can make these. Thanks for sharing! Thank you for this! I’ve been making falafel for years, and I don’t know why my little brain has never thought to put it in the oven. I will definitely try this next time! My husband is from Iraq and it always cracks him up at how crazy Americans are over falafel and are willing to pay so much for them. In the Middle East falafel is consider “poor people’s food” because it is very very inexpensive because of it’s ingredients….funny….here we have 99 cent cheeseburgers and there they eat falafel….cheeseburgers there are too expensive and falafel here is too expensive! I need to add more Mediterranean dishes to my repertoire and this looks like a good one. 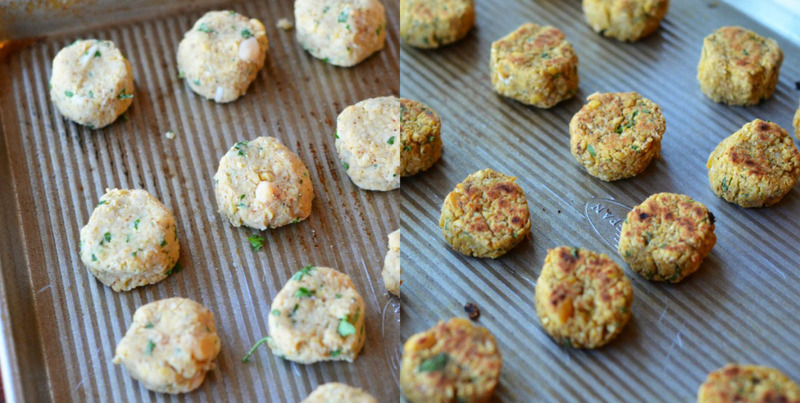 i absolutely love falafel – and i love that these are baked! Wow. That looks AWESOME. I’ve never tried my hand at falafel, but this looks incredibly easy! Wow what great timing. I just had falafel for the first time yesterday at work and was looking for a recipe. I can’t wait to try this. They’d be even better with home cooked chickpeas I bet. Might have to bust out the crock pot this weekend and make a batch.